The 2018 corn harvest that many might rather forget is finally past us… yields were high but unfortunately so were DON levels in many parts of the province. Many farmers chose to dry and store their high-DON corn rather than sell it at harvest, in hopes that better marketing opportunities might open up. As long as your corn was dry (e.g. less than 15% moisture), cool (e.g. less than 10 degrees C) and relatively clean (e.g. minimal amounts of fines or other material) when the bin was filled, and if you ran the aeration fans regularly to keep the grain temperature low, the chance of significant spoilage over winter is relatively low. If you followed our “Storage Tips for Mouldy Corn”, your grain should still be in reasonably good shape. However, as the weather starts to warm up, corn in storage must be managed more carefully. If the quality of the corn was questionable to begin with, the chance of spoilage increases the longer the corn is kept in the bin. Keep the corn dry. The moisture content should be 15% or less to prevent mould growth. Keep it dry by running aeration fans when the outdoor humidity is below 65%. Take a moisture sample from the bin. The wettest spot is likely the top of the bin in the centre. If there was moisture migration in the fall, this is likely where the wettest spot will be (see Figure 1). If this moisture is above 15.5%, additional drying is needed to prevent mould growth. If only a small amount of extra drying is needed, run the aeration fan anytime the outdoor humidity is below 65%. Shut the fan off whenever humidity rises above 65%. This will dry the grain to 15% moisture or less. It may take several days or weeks of running the fan to accomplish this drying, so be patient and monitor the grain closely as it is drying. If more drying is needed, remove the grain from the bin and dry it in a high-temperature dryer. Keep the corn cold. 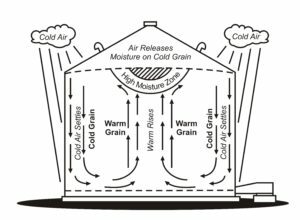 Keep the grain temperature below 10 degrees Celsius whenever possible. To cool the grain, run aeration fans at night. Nighttime temperatures often drop below 10 degrees well into June. 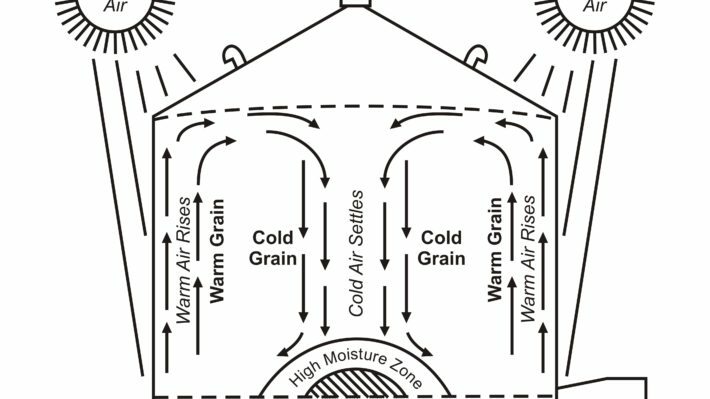 However, try not to run fans if the nighttime humidity goes above 70%, otherwise the grain moisture could increase. 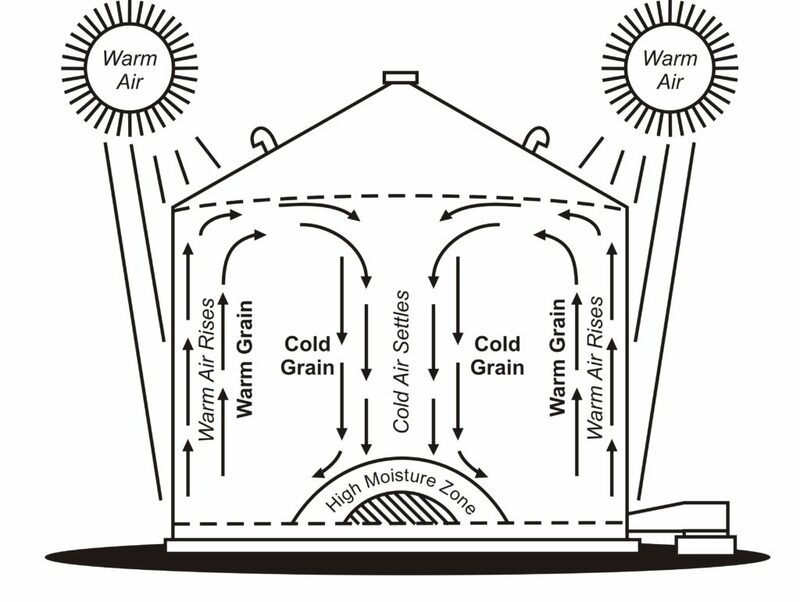 Keep the grain temperature within about 8-10 degrees C of the average outdoor temperature. This may mean warming the grain up if it was frozen well below 0 degrees over the winter. 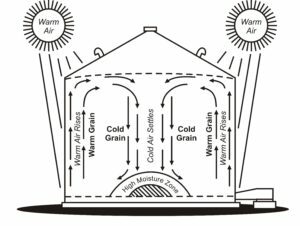 If the grain is kept too cold, the warm outside weather may cause uncontrolled air circulation inside the bin. This will cause moisture to move within the grain mass, and a wet spot can develop at the bottom of the bin. (see Figure 2) This is very hard to detect and will not be discovered until the bin is unloaded. Run fans and smell for foul odours. Look for evidence of condensation inside the bin roof, which could indicate uncontrolled air movement (Figures 1 and 2). Visually check for signs of mould. Use a temperature probe to detect warm spots. Consider installing temperature & moisture cables to monitor conditions throughout the bin. Handle corn as little as possible to prevent damage. Damaged and broken kernels and fines are more susceptible to mould growth and spoilage. If the corn has high DON levels, sell it as soon as possible. The risk of mould regrowth and DON level increase is higher as the weather warms up. If corn will be stored into the summer, dry it to 14% or even 13% to provide extra prevention against mould growth in warmer weather. Marketing opportunities are available for high-DON corn, with some discounts applied. Contact your local elevators and grain buyers to obtain more information about local marketing opportunities which may exist. 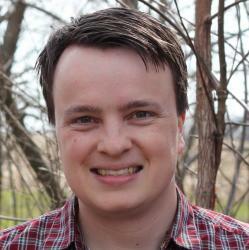 For more information, review OMAFRA’s grain aeration factsheet, the Crop Protection Network article “Storing Mycotoxin Affected Corn” as well as visit the Crop Protection Network Website for further field crop related crop protection issues information.